Adelaide Strikers is passing very good time in recent time in the ongoing season of Big Bash League tournament. It is the 7th season of BBL where as usual total eight teams have participated. Among them top four will get clearance for the knockout round. Adelaide Striker has already secured their position by standing on 2nd position on the point table after playing total nine match in the season. Their last match was against Melbourne Renegades where they got victory by 26 runs. Through the victory, Adelaide Strikers got 7th victory in BBL 2017/18. It was the first head to head battle between this two teams in the ongoing season of Big Bash League where Melbourne Renegades are not in the charming mood. They faced very competition to get qualified for the next round. But overall, their position was good and would get chance to qualify still. It was the 9th match of Renegades where they won five matches. Including the last match, they lost four and so, they needed more victory to secure their place. 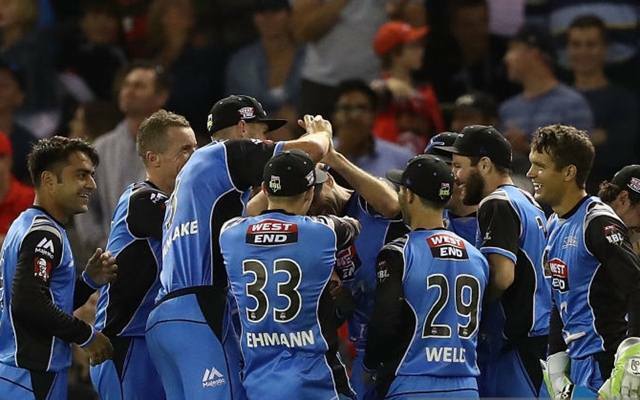 The match between Adelaide Strikers and Melbourne Renegades was the 35th match of the tournament of BBL where Melbourne Renegades won the toss and decided to bowl first. Basically chasing seems an easy option in the ground but Strikers did not take the bait. They played well and presented a good score in front of the Renegades. They scored 173 runs by losing five wickets in selected 20 overs. In return, Melbourne Renegades failed to chase the score but finished their innings with 147 runs. They lost seven wickets in 20 overs. For Strikers Colin Ingram scored 68 runs highest and on the other side, Brad Hodge scored 30 runs and remained not out for Renegades. Strikers came to open their innings with Carey and Weatherald where in just 11 runs opening partnership was broken. In 2nd wicket partnership between Carey and Head, they added almost 50 runs when Carey was gone with 32 runs. Later, Head made another partnership with Ingram and led the team to a good total. Head and Ingram both touched half century each where Head scored 58 runs so far. Rest players did not added significant runs but in the meantime, Adelaide Strikers scored 173 runs in 20 overs so far. Came to chase the score, Renegades failed to make any long partnership and most of their players scored two figure runs but their score did not big enough to led the team to a glory. So, by losing seven wickets their innings ended up with 147 runs.